Empire teamed with a private developer for new construction of the 6,500-square-foot Webster, NY location of Mavis Discount Tire, one of the largest independent multi-brand tire dealers in the United States. Empire completed a new addition, interior remodel and site improvements to the existing 16,000-square-foot ALDI building located in Brockport, NY. Our experienced team has completed multiple projects for Fresenius Medical Care, and its premier private development team, across the country. The Empire team helped bring the first TITLE Boxing Club franchise to Upstate New York. Featuring a renovated 1937 Sterling Diner, the 40-foot-long vintage diner located in historic Larkinville, consists of 11 counter stools and additional booth seating for a total capacity of around 50 people. Empire focuses exclusively on small and mid-size work - tenant improvements, renovations, and quick-turn new construction. We offer the personal service and low overhead of smaller firms, backed by the deep resources of TAYLOR - The Builders. 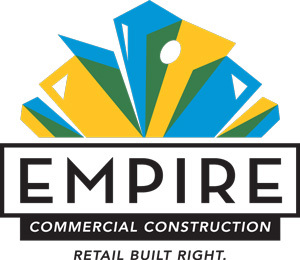 Empire Commercial Construction is a retail-focused General Contractor with over 30 years of experience in Upstate New York and across the nation. Our seasoned project team has successfully completed scores of renovations, build-outs and pad locations for premier national restaurants and retailers. We demand the adherence to your schedule while maintaining tight quality controls to make sure it’s built right the first time. Empire was awarded the construction contract for the ALDI location in the Town of Greece, NY. Empire recently completed construction of Pediatric Urgent Care of Rochester in the Town of Perinton, NY.